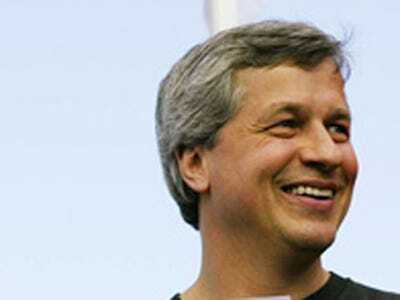 Jamie Dimon just got awarded his 2010 payout — and it’s very nice. JP Morgan bestowed on their chief a restricted stock payout of $17.4 million; 50% more than the initial value of his annual payment last year according to Dealbook. Dimon got 251,415 restricted shares worth about $12 million, as well as 367,377 options valued at over $5 million. (In 2009, he got 195,704 restricted shares worth $7.95 million and 563,562 options worth $6.24 million). Of course that’s just his regular compensation, and he may receive a not-yet-disclosed cash bonus, Bloomberg reports. And considering his bank hit a record $17.4 billion profit in 2010, we wouldn’t be surprised if that bonus is monumental. So let’s compare that number to his compatriots at other banks. Dimon trumped Citi’s Vikram Pandit big-time; Pandit declined to take a bonus for 2010. Though his salary did increase from a $1 to $1.75 million. Dimon definitely beat Morgan Stanley’s James Gorman. He got deferred stock and options worth about $7.4 million. And we know he beat BofA CEO Brian Moynihan’s $9 million — even Moynihan’s deputy beat Moynihan. But did he beat Lloyd Blankfein? Yes. Blankfein was awarded a $12.6 million stock bonus for 2010, with a salary increased of $600,000 to take the magic number to $2 million. As for his other JP acolytes, investment bank chief Jes Staley was awarded $8 million in restricted shares and 230,770 stock options, while CIO Ina Drew got $7.4 million in restricted shares and 153,847 options.